Hi everyone, I have a laptop that has a DC jack that’s not the usual style that’s soldered onto the motherboard - it’s just wired over to the edge of the laptop. The problem is that the plastic retainer broke, so the jack just fell into the laptop. I opened the laptop to attempt a repair and that’s what I found. Does anyone have a suggestion for fixing this? The plastic is too cracked and broken to be repaired by simply gluing a crack - it’s totally deteriorated. It seems that the stress of being plugged in and yanked out along with the age of the laptop has broken apart this plastic retaining slot. 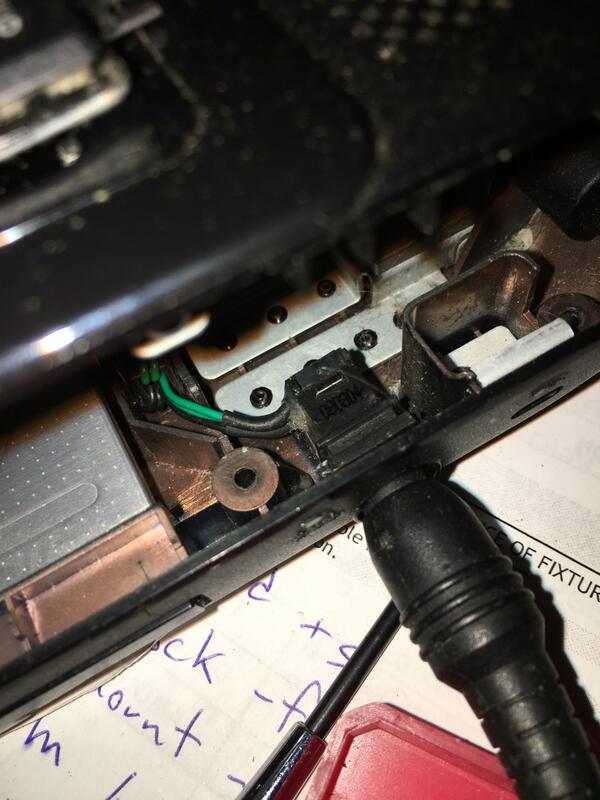 The picture shows the cable plugged into the jack and the jack is currently in its housing, but it’s too broken to hold it longer than after being unplugged and plugged back in one more time. You can use an epoxy glue/adhesive but I'm sure that the plastic around the port will begin to crack into larger chunks. You might want to look into getting a new shell for your laptop to avoid the crack/damage from spreading to other areas of the chassis. You forgot to mention the make and model of your laptop as well as it's SKU. Thank you for responding! The laptop is a Toshiba Satellite L355D-S7815 and I believe the SKU is PSLE8U-00M00W. It's a ~2009 "desktop replacement" 17" screen thing. I wouldn't want to invest in a new shell for this machine, but I think epoxy is probably the right way to go. Do you think a 5-minute, regular long-set or putty epoxy is best here? Thanks again! I would fabricate (pull out the Dremel) a metal bracket like THIS and hold it down with those 2 existing screws. Wow - thanks for that excellent suggestion! It's definitely the most robust of any I've heard. I have already used a 5-minute epoxy, building up a bit of support for the DC jack and tested it today (12 hours later) by plugging in and unplugging the AC adapter. It seems pretty strong, but we'll see. If it fails, I just might give the fabricated bracket a shot! Thank you all again. Question Access inside case of ASUS 501VW. Blocked by plastic disks over screws. Question 'S' key keeps popping out along with the retainer if pressed in a particular way. After reinstalling factory settings my VRAM and possibly my graphics card are no longer retaining the same memory. Question can GPU cause PC won't boot into BIOS ?